The ancient Egyptians would have known it as the sixth day of Pachon. The Mayans named it 4 Ahau 3 Kankin. To us it is 21 December, 2012. On this day, it was said, the world would come to an end. This is not the first time we've been told that our time is up. Religious and secular, past and present—Apocalypse covers each and every one of our prophesized dooms: featuring asteroids, Antichrists, solar flares, Singularities, utopias, UFOs, Zoroastrians and Zapotecs, to mention but a small few. The result is a thorough history of one the most fascinating threads of our cultural existence: spanning from the first warnings of our ancient ancestors, to the contemporary (yet equally glum) forecasts for our future. Chapters include: Counting Down to the Apocalypse; The Beginning of the End; The Crucible of Judaism; Waiting for the Antichrist; The Waning of Theology; Eyes Turned Toward Heaven; The Current Contenders; The Seventh Seal; more. Imported from Britain. 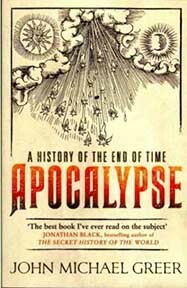 APOCALYPSE: A History of the End of Time By John Michael Greer. 272 Pages. 6x9 Paperback. Illustrated. References. Index.